[iPhone] Do you think you would enjoy a modern brick breaker game? Try Anodia! Have you played any Atari games in your lifetime? If you did (or maybe even if you didn’t), then you probably remember a classic game by the name of Breakout. Yes, I am indeed referring to the game with a small rectangular paddle along the bottom, a ball, and bunch of bricks ready to be destroyed. Breakout was a such a monster hit that it still lives on in video games and apps today in some form or another. 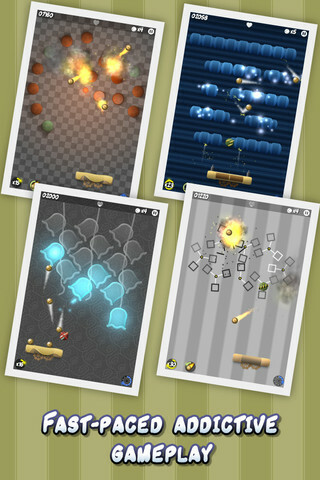 One of those apps, Anodia, is a unique and modern take on the typical brick breaker game. Anodia provides hundreds of beautifully designed levels that display impressive real-time physics. The developer provides the user with the option of touch control or tilt control of the paddle. The tilt control is quite a challenge, but it is definitely a worthwhile option to try and master if you want increase the difficulty level. Anodia also boasts over 20 power-ups and power-downs that disperse from damaged objects. You need to learn which powers hurt you and which make the game quite difficult. Your score will benefit in the long run if you do. Though I thought the game was a bit slow for my liking after being used to the faster game play of Jet Ball , the user interface (i.e. the bricks) is what really pulls you in and catches your attention. And no, they are not actual bricks, but beautifully designed formations that break apart as you smash them with the paddle balls. This ultimately creates very cool laser light shows of destruction, which adds to the esteem of the game.